Description: Ideal for both standard weapons and assault rifles these Red Dots are among the the most professional units of their entire category. Each model comes with an array of innovative features that will satisfy even the most demanding users. - SPECS - 3X POWER MAGNIFICATION - FULLY MULTICOATED LENSES - 1/3 M.O.A. 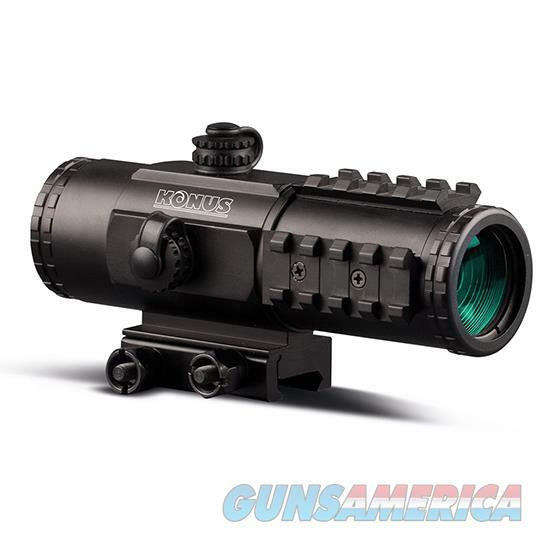 CLICK ADJUSTMENT TURRETS - INTEGRATED TRI-RAIL SYSTEM - MOUNT SUITABLE FOR WEAVER/PICATINNY RAIL - NITROGEN PURGED WATERPROOF FOGPROOF SHOCKPROOF - FLIP-UP LENS COVERS - RED/BLUE ILLUMINATION - TECHNICAL DATA - Model: SIGHT PRO PTS2 - Diameter: 30mm - Length: 146mm / 5.74 - Weight: 480gr / 16.9oz. - Dot size: 2.8 M.O.A.